All arches, except tree-shaped arches, now have LED lighting. 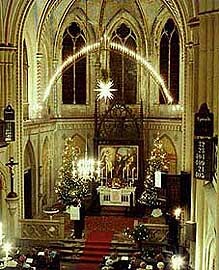 During the Christmas season, windows throughout the Saxony area of Germany are lit with the soft lights of Schwibbögen, or Christmas arches. These traditional displays reach back over 270 years to the silver mines of the Erzgebirge in Germany, and the first Schwibbögen, made out of wrought iron, are thought to have originated in the town of Johanngeorgenstadt. Schwibbögen were especially popular during the Christmas season. Christmas was the only time in the year when the hard and dangerous work in the mines came to a rest. Wives put the Schwibbögen in their cottage windows and lit the candles to welcome their husbands home after a hard day in the mines. The twinkling lights in the windows guided the miners as they trudged through darkness and snow, and welcomed them to the warmth and security of their homes and families. and churches in the Erzgebirge. of income throughout the Erzgebirge. Schwibbögen were carved in homes and decorated with candles. Today, the candles are often replaced with tiny electric lights. 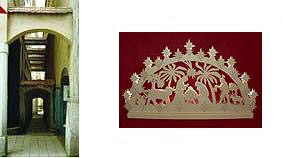 have become known worldwide as symbols of Christmas folk art. made by hand in a small, family-owned factory in the Saxony region of Germany. lights are also added by hand. accompanied by a label guaranteeing that it is handcrafted. Doppelschwibbögen come in a variety of Christmas designs -- everything from Christmas market scenes to sledders to whimsical snowmen. Doppelschwibbögen are also available as Christmas tree designs.